In 2008, farmers in Northern Sumatra in Indonesia noticed that some of their crops were missing. 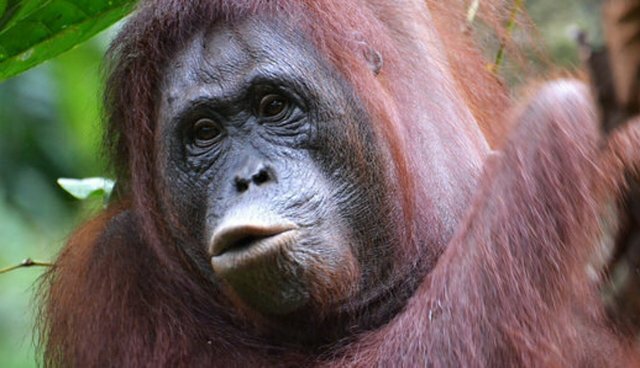 It turns out, the culprit was an older female orangutan, pushed out of her habitat from the development of palm oil plantations. She was relying on their crops to survive. Fearing that the orangutan would be killed for stealing crops, conservationists at the Sumatran Orangutan Conservation Programme (SOCP) captured the ape, whom they named Gober. They realized that she was blind in both eyes, and it was thought that she would never return to the wild again. Cases of twins are rare in orangutans, but twin orangutans born to parents who are both blind is totally unheard of! Being such an experienced mother, and despite her handicap, Gober proceeded to rear both infants in exemplary fashion; Ganteng (meaning handsome, a male) and Ginting (a local karonese name, female). Another stroke of good fortune soon befell Gober. A top Indonesian ophthalmologist offered to perform cataract surgery to restore Gober's eyesight, and the operation was done in 2012 to great success. Now, caretakers believe she has her full eyesight back, but Leuser's blindness cannot be fixed (the pellets he was shot with are still lodged in his eyes), and he will remain in captivity for the rest of his life. With her eyesight restored and the twins now 4 years old, it was time for Gober to return to where she belonged. Gober, Ganteng and Ginting were taken to the Orangutan Reintroduction Station in the Jantho Conservation Forest. The three apes were released from their cage, and they took to the trees, back to the type of habitat that Gober had been forced out of seven years earlier. But not everything went smoothly. A statement from the SOCP says that while the female twin took to the trees happily, Ganteng, the male, was left behind. Normally, female orangutans are the sole caretakers for their young. The babies are weaned at about 6 years of age. Males will soon begin to wander away from their mother for short periods of time, while young female offspring will stick around until their teen years. Eventually, they will strike out to live independently. Gober is now free again, and free of the stress she's endured in captivity all these years. 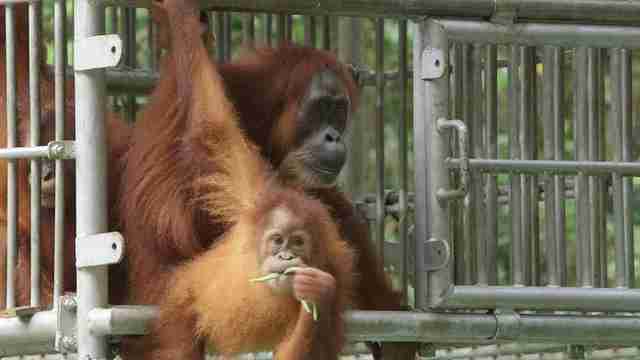 Ginting is also now a wild orangutan, with the best teacher she could possibly have. Ganteng is also still safe, despite his ordeal, but he will get another chance and we still very much hope we can get all three of them living side by side in the same forest within the not too distant future.